Enjoy breathtaking views of the San Tan Mountains from this nicely upgraded 1415sf 2bed, 2bath Del Webb designed Pulte home in the active adult community of Solera at Johnson Ranch. All on one level, this beautifully maintained single owner home will welcome you with warm neutral colors & expertly designed living space. Step through your front door & into the inviting great room floorplan and spacious eat-in kitchen with corian counters, maple staggered cabinets, R/O system, tile backsplash, stainless steel appliances, pendant lighting & a breakfast bar. Need more room to mix and mingle? 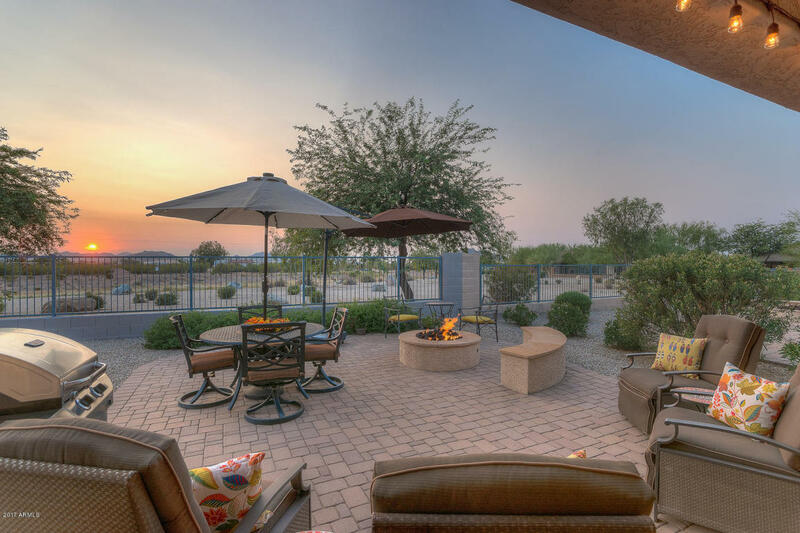 Head outside to your custom patio with hardscaping, desert landscaping & lighting, and a seating area with built-in firepit for incredible views of the sunsets over the San Tan Mountains. Back inside... you'll find a roomy master suite at the back of the home to take advantage of the view, while the guest bedroom can dual as an office or den at the front of the home with a full guest bath for overnight stays. With its own gated entry in this 55+ amenity packed community, Solera has its own private 10,000 sq ft clubhouse with a fitness center, outdoor pool, billiard room, card room, library, kitchen, general purpose room that hosts resident activities and bocce ball court exclusively for its residents. Part of the Johnson Ranch Master Planned Community, Solera guests have access to outdoor pools, tennis courts, pickleball, pitch & putt golf course, frisbee golf, catch & release pond, softball & soccer fields as well! Just 4 miles to the 10,000 acres of San Tan Regional Park with hiking, biking, horseback trails & wildlife and just south of the rapidly growing Queen Creek Marketplace filled with boutiques, retail stores, eateries and traditional restaurants - Now THIS is a nice way to enjoy your retirement years!